Paris Plages | One quality, the finest. Why does Paris exist ? The Seine. It’s no accident that every major city your can probably think of is next to a body of water. An abundant source of water for daily life and transportation has always been absolutely essential. 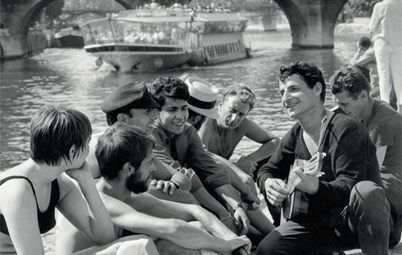 A free exhibit at the Mairie de Paris (Paris City Hall) Paris sur Seine: des anciens quais à Paris Plages traces the symbiotic relationship between Paris and the Seine. The exhibit features maps, photos, drawings, and paintings of the Seine as a place of revenue, recreation, and romance. I learned all sorts of surprising facts. For instance, in the Middle Ages, boats carrying supplies sometimes had to wait on the river for a month before they could dock and unload. I hope they weren’t carrying perishables! A popular sport used to be jousting tournaments held from boats, even though many of the participants could not swim. I loved the photos from the 50s of the swimming pools that used to be on the Seine. The platforms surrounding the pool were covered in a solid mass of sunbathers, while the pools themselves were empty. The exhibit marks the 10th anniversary of Paris Plages (paree plajsh), the beach installed along the quais of the Seine for a few weeks in the summer. Since the weather here at present is so grey and cool, looking at photos of summer fun may be the best way to experience Paris Plages this year. The exhibit is open every day but Sunday until September 17, 2011. This entry was posted in Events, Travel and tagged Mairie de Paris, Paris Plages, Paris sur Seine, Seine. Bookmark the permalink.